"Long ago, the forces of this world battled furiously with those of another. The scars left behind formed the beginnings of the great barren lands." Filgaia is the larger of the two worlds in Dream Chaser's setting. It is the second planet from the system's yellow star, and in many ways, is quite similar to Earth. Its orbital period and rotation are functionally identical, and its atmosphere and temperature are ideal for human life. It is, however, a dying world: increasing desertification has rendered more and more of its surface lifeless, both in the wake of natural and man-made disasters. Filgaia is a world of ruins, secret history, and mystery that its people live amidst and try to survive as best they can. There are as many theories about the origins of life on Filgaia as there are stars in the sky. Some believe the Elw brought humans to the world; others that the Guardians grew them like seeds. Others suggest all life arrived in the manner of the Night of Falling Stars -- descending from the heavens on wings of steel. On other points of history, there is more agreement. There was once a civilization called Zeboim that ruled over Filgaia in a golden age, until a catastrophe laid them low. A millennium ago, monsters called Metal Demons surged out from the earth, only to be beaten back by the combined forces of mankind. And five hundred years after, the Day of Collapse, when the nations of the world clashed and fell apart. What is left after this devastation is a battered and barren land. Large swaths of desert seem to spread with each passing year, slowly consuming precious acres of arable land. Twisted monsters swarm out from the badlands, swallowing settlements whole. Kingdoms and empires hold together little islands of stability, all the while digging up weapons long buried by history. And year after year, the wind blows a little softer, the earth yields a little less, and water does not taste as sweet, until only one conclusion remains: Filgaia is dying. No one is quite sure whether it can be saved. For a more detailed history, see Filgaia's timeline. 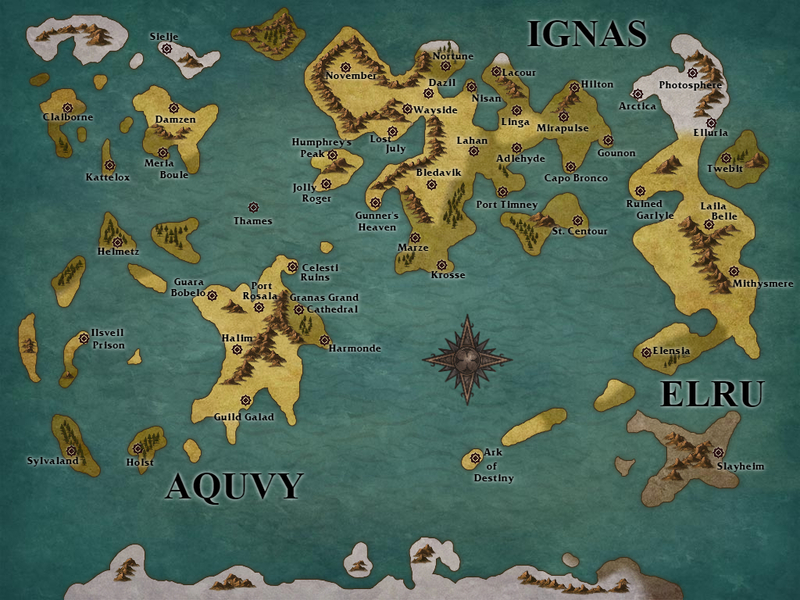 Filgaia is divided into three continents: Ignas, Aquvy, and Elru. The largest of these, Ignas, contains three major powers -- Aveh, Kislev, and the Kingdom of Adlehyde -- and a handful of smaller nations. The northwestern regions of Ignas -- commonly known as the Badlands or the frontier -- also play host to the scattered communities established in the wake of the Night of Falling Stars. Aquvy is the smallest of the three continents, and is bordered on the east and south by a long chain of islands collectively known as the Aquvy Archipelago. Aquvy proper is home to the nations of Meria Boule, Sylvaland, Guild Galad, and the remains of Celesti; the most noteworthy feature of the Archipelago is the headquarters for the Ethos Church. The final continent, Elru, is east of Ignas and Aquvy and home to the Kingdom of Elesius, the largest Veruni Control Zone, and the ruined nations of Arctica and Garlyle. On the Ignas continent, Aveh and Kislev are at war. The desert between the two nations is a former battleground from the Metal Demon Wars, and their soldiers are battling back and forth to claim dig sites and excavate ARMs. Recently, Aveh has been receiving assistance from advanced Gears that outmatch even the battle-tested Kislev forces. The tide of the war is beginning to turn. Fearful of the power of this new Aveh, the Kingdom of Adlehyde has entered into a formal cooperation treaty with several smaller nations, most notably the Kingdoms of Krosse and Lacour. As for the colonies established in the wake of the Night of Falling Stars, they keep to themselves. They have their own problems -- chief among them twisted monsters wandering the landscape. The continent of Elru has been wracked by disaster in recent years. A handful of large settlements were destroyed six years ago by a single combatant; stories of the so-called "Demon of Elru" are still told to this day. The city of Slayheim was devastated by what appeared to be a malfunctioning ARM; the entire landscape around it was turned to dust and salt. The Kingdom of Garlyle was also destroyed. And the military nation of Arctica, which withstood even the Day of Collapse, ceased all communications with the outside world shortly thereafter. The Kingdom of Elesius is the lone remaining human power on the continent, and it is preparing for the worst. The safest part of Elru is controlled by the mysterious Veruni: believed to be boogeymen and specters by all but Elesius, which now stands alone against the alien neighbor to the north. Aquvy is comparatively untouched by this chaos, but Meria Boule, Sylvaland, and the merchant republic of Guild Galad are watching world events with concern. This concern is justified after the nation of Celesti tore itself apart in a terrible civil war that left their nation in burnt ruins. As for the Ethos, the Baskar Tribes, and the small settlements dotting the Aquvy Archipelago, they continue as they always have. And then there is Solaris -- a mysterious nation everyone has heard of, but none have ever visited. Little is known of Solaris beyond the sheer power of their military, which is backed by advanced ARMs and Gears that have not been seen since the Metal Demon Wars. Even though few have seen Solarians in action, stories are told in every bar about how their agents control the leaders of the world. Filgaian culture varies widely from place to place and continent to continent -- little but geography connects the colonies of the Seed fleet to the idyllic life lived in the Aquvy Archipelago, for example. But a few common threads emerge. While a variety of faiths are practiced across Filgaia (see our file on religion for details), worship of the Guardians -- spirits that protect and sustain the land and those who live upon it -- is commonplace. Outside of the Baskar Tribes, this is often minor reverence alongside their churches. This has created no small amount of religious tension, which can be found throughout Filgaia. As a result of the various catastrophes in Filgaia's history, advanced technology is widely distrusted by the average citizen (Guild Galad being one of the few exceptions). This is less true in the Badlands, especially in the cities formed after the Night of Falling Stars. However, many of the farmers and city dwellers are at least suspicious of these technological relics (see our file on ARMs for details). The image of the heroic Drifter wandering across the wastes is beginning to take hold in the eyes of the common man, thanks largely to the publication of the book To Those Who Come And Go. While few believe even half of the book's stories are truth, they have proven to be an entertaining diversion to a world desperately in need of one. Drifters -- and their brethren, the Geohounds, Diggers, and members of the Adventurer's Guild -- are both despised and revered, simultaneously needed and resented for their work. The inherent distrust most Filgaians hold toward advanced technology makes any sort of mass communications impractical at best. As such, the most common means of communication on Filgaia is word of mouth; most travellers stopping by in a village will be offered a free drink or meal at the local tavern in exchange for news from the places they've been. It is important to stress that there is no such thing as a world-wide broadcast system on Filgaia; television does not exist on the surface, and the few radios in existence are found only in the Badlands and operate on line-of-sight principles. The Telepath Towers in Aquvy are cost-prohibitive and under the control of a single nobleman, who is not apt to share. This is also true of other advanced communication devices excavated from ruins. To be clear: there is no in-character radio system because the technology to build and sustain one does not exist on Filgaia. The mechanical printing press is becoming increasingly common in the large cities, and cheap, mass-produced books are beginning to flow out into the hinterlands. Guild Galad and Adlehyde have broadsheets, but these are essentially advertising circulars with a small amount of local news to fill it up. The concept of a journalist, let alone freedom of the press, is considered laughable in most countries. The only other form of communication operating on Filgaia are Memory Cubes -- glowing yellow objects whose origin is lost to history. They can be found scattered across the planet; every settlement seems to have at least one, and they can be found in forests, mountains, and often outside ruins. These Cubes can be used to send messages to anyone known by the user -- simply step into the light, identify the recipient, and dictate the message. Memory Cubes are connected to each other, such that next time the recipient accesses any Cube, anywhere, he or she will receive any outstanding messages. Memory Cubes are incredibly useful and see frequent use by merchants and tradesmen; even common laborers will stop by one every day, just to keep in touch with kin. Memory Cubes and Goddess Statues are functionally identical, but do not connect to each other. In OOC terms, both operate through the MUSH's bulletin board system. Travel on Filgaia is dangerous. The roads between a kingdom's major cities are frequently patrolled and relatively safe, but on less traveled (or profitable) routes, monsters and brigands strike the weak and unwary without hesitation. The Adventurer's Guild does a brisk business escorting travelers from place to place, and merchants moving between cities do so with guards. Most travel on Filgaia is done on horseback. Blacksmiths, farriers and horse traders are found in nearly every settlement, and the vast majority of people (especially in rural areas) learn to ride from an early age. It should be stressed that as a result of their many uses as labour and transportation (and occasionally food), horses are an extremely valuable commodity, and a frequent target for thieves and rustlers. You can buy a horse nearly anywhere, but renting one is out of the question. There is little organized travel between kingdoms. On Ignas in particular, tensions between the major nations are so high that travelers from foreign nations are viewed with suspicion. Almost the only way to move between countries is as part of a merchant's caravan, and merchants often operate a profitable sideline transporting small packages from places they're going to places they've been. Sea travel is fairly common in the coastal regions, but less so between continents. Piracy is practically unknown around Ignas and Elru, but monsters -- and the elements themselves -- make sailing a risky proposition. Sailing is easier and more common on Aquvy, where the Archipelago requires boats to cross such distances. All of Filgaia is abuzz with news of a meteor that ripped across the night sky, and is said to have landed on the continent of Elru. Rumours abound of strange monsters pouring from the crash site, and the Kingdom of Ell is said to be under siege. The fearful populace has given the meteor the nickname "The Sorcery Globe," and whispers are beginning that another war against monsters may soon begin. After months of speculation, Prime Minister Shakhan of Aveh has announced that the strange Gears that have been seen accompanying his forces into battle against Kislev belong to a group called Gebler, said to be the military force of Solaris itself. Few who have seen Gebler's Gears in action have any reason to doubt the claim. Shortly after Gebler's identity became public knowledge, King Justin of Adleyhyde proclaimed his nation had uncovered the resting place of four ancient Golems from the Metal Demon Wars - Diablo, Lolithia, Barbados, and Asgard. He then announced the Golems would be the centrepiece of an Ancient Culture Exhibition; in partnership with the Ethos, several ancient ARMs discovered within Aldehyde's borders will be showcased. While many suspect the Exhibition is a none-too-subtle display of Adlehyde's power to an ascendant Aveh, scholars are nonetheless flocking to the region to prepare. In support of his alliance with Adlehyde, King Ardryn of Lacour has moved the date of the Lacour Tournament of Arms, ensuring it will not conflict with the Exhibition. Following that event, however, Drifters from across the world will travel to Lacour, preparing to do battle for the title of the World's Strongest Warrior. To maximize participation, Ardryn has also waived the requirement for entrants to procure equipment from local arms dealers. The Ethos has recently posted the largest bounty ever recorded -- 60 million gella -- for the man said to be responsible for the destruction of the city of Lost July: Vash the Stampede. The Adventurer's Guild has refused to condone the request due to the "dead or" part, but bandits and Geohounds the world over are on the lookout for a fortune on two legs. This page was last edited on 12 May 2018, at 16:57.